I am one of those unlucky women that have been plagued by adult acne for my entire life. I have joked with my dermatologist that I will soon be his oldest living acne patient. Although I am a mom, I sometimes feel like I have the skin of a teenager. When will it end? Through the years I have tried every skin product advertised, but the only thing that helped was a professional “cleaning” by a dermatologist, which can be both timely and costly. 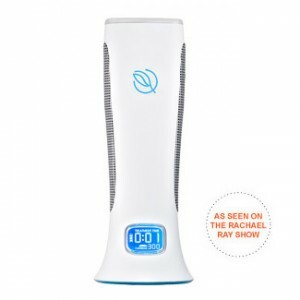 Tria has produced a Blue Light acne system which delivers high energy technology, penetrating the skin and eliminating that nasty bacteria which causes acne. It is strong and powerful, but gentle enough to use even on a daily basis. Yet after using it just twice a week, I have seen great results in my small blemishes, breakouts and most of all, skin tone. I used to think that having great skin meant expensive products or really time consuming routinues, but as a busy mom I can commit to just 5 minutes! First step in the process is to naturally clean your skin. There is a skin perfecting foam cleanser, but you can really use any good cleanser that you like. Next, you just glide the Blue Light, which is sleek in design and easy to handle, over the affected area for about 5 minutes, once a day. The light will turn on as soon as it touches the skin, and it also has a timer that will shut it after 5 minutes, so it really is fool proof. I find it best to do before bed, but if you wish you can do 2 1/2 minutes in the morning and 2 1/2 minutes at night. The third step is to nourish your skin. Again, Tria sells a Skin Perfecting Serum, but you can use a good moisturizer. This product is FDA approved. It cannot damage your eyes or skin. Tria Blue Light retails for about $245 and is worth the initial expense. Tria Skin Perfecting Blue Light is sold at www.TriaBeauty.com and retails for $245. It includes the Skin Perfecting Blue Light, the Skin Perfecting Blue Light Treatment cartridge (good for use to 300 minutes) and a battery charger. It is a product you use over time. As a mom, I never seem to have time for myself, but now I have made time for the 5 minutes a day and it shows. www.triabeauty.com This is a great gift idea for someone who “has it all” or someone who never takes the time to take care of themselves. Hey, maybe it is a great product to buy for yourself. As usual, check with your doctor before trying any new products in case of skin sensitivity or side effects with medications. Natural beauty is now we can see so more less and every one are try to use more cosmetics now. This is so good that we find more new invention in here those are well technolize. Thanks for some other excellent article. The place else may just anyone get that type of information in such a perfect approach of writing? I’ve a presentation subsequent week, and I am at the look for such info. Also I forgot to put it into the ingredients but put two cups of water in before you blend. 1 small scoop protein powder. The spinach may throw you off but it has a very neutral taste and when you mix it with the berries, you can’t even taste it. Give it a shot! And also, if you check out my “About” page at my blog http://www.stepintothegym.com I tell the story of my acne and how I overcame it through a lifestyle change. It is very fine post. I like cosmetic. So I like this kinds of review. So thanks for this. I’ve been seeing dermatologists for over a decade. I’ve had several diagnoses over the years, none of which have gotten it right. It turned out that the core fundamental underlying cause was celiac, and this was complicated by soaps and hormones and vitamin deficiencies and other things. Good luck, and don’t give up looking for a solution! I’ve just found some that work for me in the past couple months. My skin is now better than it’s been in YEARS! !